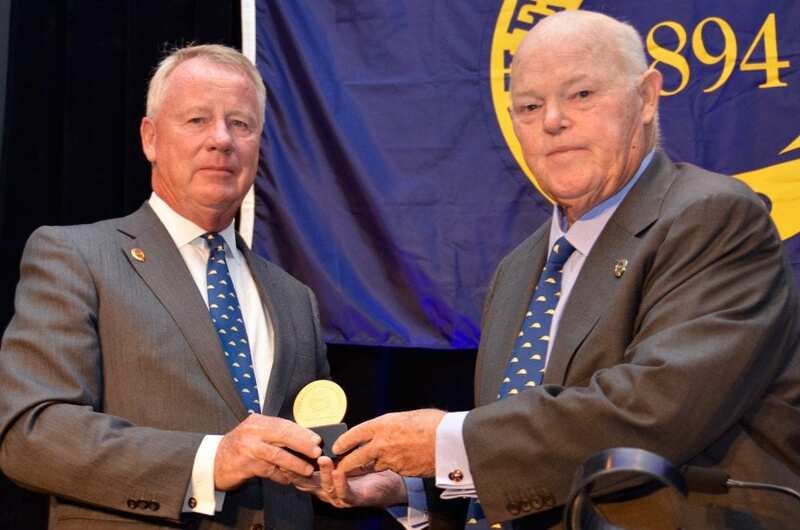 At the conclusion of Sunday's Jockey Club Round Table on Matters Pertaining to Racing in Saratoga Springs, N.Y., newly elected Jockey Club chairman Stuart S. Janney III awarded The Jockey Club Medal to outgoing chairman Ogden Mills “Dinny” Phipps, who announced his retirement from that position in June. Phipps, 74, has chaired The Jockey Club since 1983. “For 32 years, Dinny Phipps has opened and closed this conference. His tenure as chairman of The Jockey Club concluded yesterday at a Board of Stewards meeting in this hotel. “He's not much for fanfare, particularly any that focuses on him, but he richly deserves accolades for the time and effort he's devoted to the Thoroughbred industry in general and The Jockey Club in particular over a long period of time. “The Jockey Club has thrived under his leadership over the past 32 years. He's been there to lead the way in the growth and efficiency of The Jockey Club and our affiliated companies. “With his guidance, we have made significant strides in the areas of medication, aftercare, technology, and marketing to name just a few. He has believed for a long time that The Jockey Club should be more than just a breed registry, and for the past 32 years it surely has been. “He's quietly devoted thousands of hours to initiatives he thought would improve the conditions of Thoroughbred breeding and racing, often reminding those around him of the importance of consumer confidence in our sport. “When it was important for American racing or for The Jockey Club, he made it his business to be there. Last October, he flew from New York to Lexington to deliver eight minutes worth of closing remarks because he wanted people to know how important the Owner Conference was to The Jockey Club. He delivered a keynote address at the International Federation of Horseracing Authorities convention in Paris last fall for the same reason. “It's hard to think of a way that The Jockey Club, or the industry, could properly thank him, but we will try. This entry was posted in People and tagged international federation of horseracing authorities, Ogden Mills Phipps, stuart s janney iii, the jockey club medal, Thoroughbred Owner Conference by Paulick Report Staff. Bookmark the permalink.